Swift is a powerful and intuitive programming language. It’s increasingly popular because writing Swift code is interactive and fun, the syntax is concise yet expressive, and apps run lightning-fast. Swift.org is the open source community where developers may collaborate on the Swift programming language. 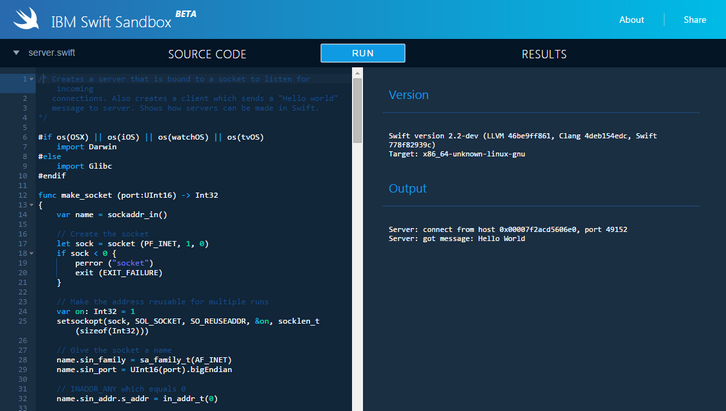 The IBM Swift Sandbox is an interactive website that lets you write Swift code and execute it in a server environment – on top of Linux! Each sandbox runs on IBM Cloud in a Docker container. Both the latest versions of Swift and its standard library are available for you to use. They’ve also provided a collection of sample programs for you to experiment with. Click Source Samples in the upper left corner to see the list of available samples.